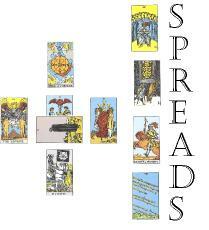 Again, there are no hard and fast rules for which spreads to use during a phone reading. Each reader pretty much has to find out what works for them. I started out using the Celtic Cross spread (pictured left). Sometimes I found it a little too cumbersome for use on the lines. Clients seemed to want faster, more concise answers. From there, I just started drawing three cards for each initial question. This gives me a quick snapshot of what is going on in each situation and feeds the client with fast, relevant information. Usually, clients just keep firing questions, so I will answer one, shuffle, and pull three more cards. I will continue to do this until we are finished. Sometimes I might have 20 cards laid out on the table before I'm finished (not often), but this method gives me clear answers on many issues in the same sitting. Some readers just aren't happy with this seemingly haphazard method of reading and feel more comfortable using spreads with very defined positions. Take a look at Power Tarot by Trish MacGregor and Phyllis Vega ($12, Fireside, 1998). This book, created by previous 900 line readers, has more than 100 spreads and detailed card meanings for all 78 cards. They break down the spreads by the number of cards in them. You'll find oodles of spreads on love, career, health --you name it. I highly recommend it. 3) Will you be happy in this relationship? 5) Will the relationship last?